Harry Englund was different than the average Staley football player. He was the only Staley not born in the 19th Century; the only player from Rockford; and one of the few men who hadn’t attended college nor been in the armed forces before joining the team. 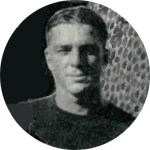 The following September Englund showed up in the Soy City as the Decatur Herald reported, “Englund is a big, strong and fast player who is expected to be a star in the ‘big league’ grid game.” In October he subbed for Halas in the first game of the season, Harry’s only game played on Staley Field. When the teamed moved to Chicago that year Englund subbed in four more games at end and in the backfield as the team won the professional championship. Each player received $25 per week from Mr. Staley as well as a portion of the gate receipts. In 1922 he joined the Bears as the youngest player on the team and started three of the eleven games he entered. After the season he returned to Rockford and played several years of club basketball. On September 1, 1923 he married Murrell Genevieve Anderson and in 1928 their only child Mary Lou was born. He played several years of amateur basketball while working at the Empire Furniture Manufacturer before taking a job at his father-in-law’s grocery store until 1940. He then worked until retirement at the Mattison Machine Works. Englund attended the October 1956 Staley anniversary reunion at Wrigley Field and was photographed lighting a cigar for Tarzan Taylor during the half-time show. Little is known of his later life but hopefully he got to enjoy playing with his grandsons Dave and Chuck Abramson in his beloved Rockford.